Don't waste the time you sleep. Use it creatively. Welcome to Creative Sleep. Here we will see how our simple sleep can become creative and solve many of life’s problems. It is a well known fact that when we sleep, our body relaxes completely and our conscious mind is at abeyance. However, our subconscious mind is always awake. It never takes a day off. 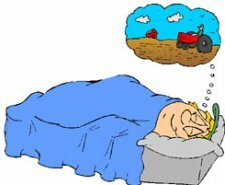 Two things happen to the subconscious mind when we sleep. One, there is no interference from the conscious mind. Two, the subconscious mind does not have to deal with external stimuli, so it is free. Hence, it can use all its resources to grapple with any problems that may be there. This is what converts our deep slumber into ‘creative sleep’. Even when we are awake, when trying to solve a problem or trying to think about something or trying to recollect something, we close our eyes. What this does is it cuts off the outside world so that our conscious and unconscious minds can work without interference. This is similar to the sleep effect. History has innumerable instances where major problems have been solved after a good night’s sleep. Many important inventions and discoveries have been made during sleep. 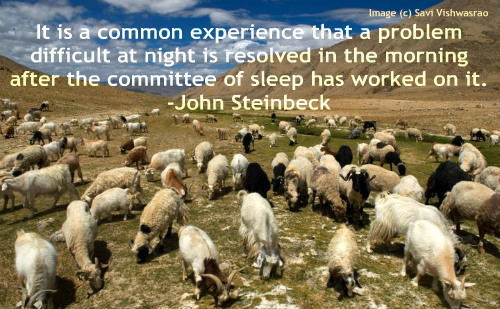 Modern scientific research also suggests that sleeping over a problem helps solve it. The great Indian Mathematician Srinivasa Ramnujan (1887 – 1920) used to say that he received visions of scrolls of complex mathematical content unfolding before his eyes in his sleep. As the conscious mind is out of the way, the subconscious mind can be approached directly. If instructed properly, it can play wonders with our life. Thus sleep, instead of being just resting and recuperating, can also become creative and constructive. Ensure that you get adequate amount of deep, undisturbed sleep. It is not my purpose here to discuss how to be good at it. If you have difficulty with it, please get help from your doctor to overcome the problem. Or, click here to know a wonderful sleep technique. Creative Sleep can be used to solve life's problems. In the following links I have discussed some benefits of creative sleep. Please remember that a variety of problems can be solved using this method. To list just a few: developing an excellent memory, developing self esteem, staying energetic throughout the day, overcoming timidity, developing concentration, developing good study habits (especially for children), etc. There are two ways in which problems are solved during creative sleep. In the first instance, one gets a dream which may have to be interpreted. In the second instance, when one gets up in the morning after a good night’s sleep, ‘pop’ comes the solution into the mind. However, one thing should be borne in mind. In both cases, the conscious mind should have earlier done a lot of work on the problem and exhausted all avenues of solutions. Only then, it seems, that the subconscious mind goes into overdrive and solves the problem. Changing beliefs is a powerful and sure shot way of changing our life for the better. Read this article to know how to do it. The infinite powers of the subconscious mind can be used for creative problem solving. This article will give you some examples of how dreams solved some tough problems creatively. In conclusion, sleep well and use the creative powers of sleep to solve your problems and live a happy and fulfilled life.